Debate Preview: Bernie Dominating Market, But Can He Go The Distance? About three days before the first Democratic debate last month, Vermont Senator Bernie Sanders began to pull away in the Ballotcraft market, opening up a double digit lead over Hillary Clinton that wouldn’t become undone. He carried that momentum through debate night, staying miles ahead of the competition and winning the final vote by a landslide. After such a convincing victory, it would be easy to peg Sanders as the frontrunner from this point forward for future debates. And the market seems to have done that, giving him a 62% chance of winning the debate. But could Bernie’s past success actually hinder him tonight? Since the last debate, Sander’s deficit in the national polls has remained roughly unchanged at 23 or 24 percent. This may influence how our focus group thinks when picking a winner: Even if Sanders is as good as he was in the last debate, will it really improve his chances of being President? I don’t expect this to matter much during trading, but it might deter me from putting all of my eggs in the Bernie basket when the market closes. I still think barring some amazing Clinton performance or complete collapse by Sanders his stock will rise during the night, but consider diversifying your portfolio come the end of the night. After Vice President Biden declared he was not seeking the Democratic nomination, the path to victory began to seem rather clear for former Secretary of State Clinton. And so these debates, primary votes, and campaign stops become almost perfunctory, as Hillary and her staff realized that very little could happen to stop them from winning the nomination. Sanders has put up a good fight, but as of yet has failed to close the gap nationally to make it a competitive race. Essentially, the only way Hillary will lose is if Sanders’ grassroots movement spreads outside of the young, liberal Democrats who comprise his base. There are a few ways that could happen: A big win for Bernie in an early state like New Hampshire, a new scandal for the Clinton camp, or a debate in which Sanders greatly outperforms Clinton. Many on our site and across the web thought that last month’s debate was an example of the latter, but the media and then later the polls showed that that was not the case. They declared Clinton the winner, even though many found it hard to imagine Bernie and O’Malley improving by any substantial amount. So the question now becomes whether this media coverage will keep our focus group voters from choosing anyone other than Clinton as tonight’s victor. They might not sway every member, but expect this to lead to a closer vote than last time. The biggest surprise (for me, at least) in October’s Democratic debate was the incredible performance of former-Maryland Governor Martin O’Malley, who not only delivered a fantastic defense of liberalism, but also made a strong case for himself as a candidate. That strong performance showed up in the focus group vote as they awarded him second place, though he was distantly behind Sanders. Again, the greatest enemy for O’Malley is the status quo, which was upheld after the debate despite his great performance. There’s not much more O’Malley can do to move up in the polls other than go after the leaders, but I think his ambitions for higher office in one of their administrations will prevent him from really letting loose. I’d put some credits into his stock now, since it will probably rise as he has another good night behind the podium, but sell off before the night is over. This is part two of our three-part series analyzing Ballotcraft’s market data during the first Democratic Presidential Debate, covering the trends that dominated the night and how a savvy investor could use them in the future. Interesting fact from Tuesday’s debate: Even though Bernie Sanders won the debate, if you had to put all of your credits in one candidate at the start of the night he would have only been the second best option. Since you’re a smart person and probably saw the title of this article, it shouldn’t be hard for you to guess that former Maryland Governor Martin O’Malley was the only candidate to beat Bernie in this regard. An 8:00 purchase of Sanders’ stock at 56.3 would end up being worth 100 credits, netting you a 78 percent profit. Whereas a similarly timed purchase of O’Malley’s shares, priced at 11.4, sold as Anderson Cooper was signing off, would end up being worth 37.5 credits, for a profit of 229 percent, far more than any Sanders investor could have possibly earned. So why did the former mayor of Baltimore outperform his expectations by such a wide margin? While you may be trying to recall a game-changing moment, like his staunch opposition to the NRA or Sorkin-esque closing statements arguing the merits of liberalism, the answer is actually much simpler than that: Martin O’Malley is just a good debater. His viewpoints, while pretty standard for your run-of-the-mill Democrat, were articulated rather well and even his weakest answers, on the unrest stemming from police relations in his hometown, were given with enough conviction and good intentions to keep his price from dipping more than three points. And thankfully for O’Malley, that question was both early on in the debate, buried in the seemingly never-ending section before the first commercial break, and short, driving the discussion for less than three minutes. With that out of the way, O’Malley was able to put on a remarkably strong performance for the last 90 minutes of the two and a half hour debate, with his price on a near constant rise the entire time. He quickly replaced Hillary as the consensus number two candidate on the site and was the only candidate to ever the share the lead with Sanders, which he did for 90 seconds towards the very end of the debate. He played up his gubernatorial experience when talking about gun control, felt comfortable criticizing or complimenting his fellow candidates, and had some terrific lines along the way. But more than anything he was consistent, and it was this quality that led his slow but sustained rise to the top. 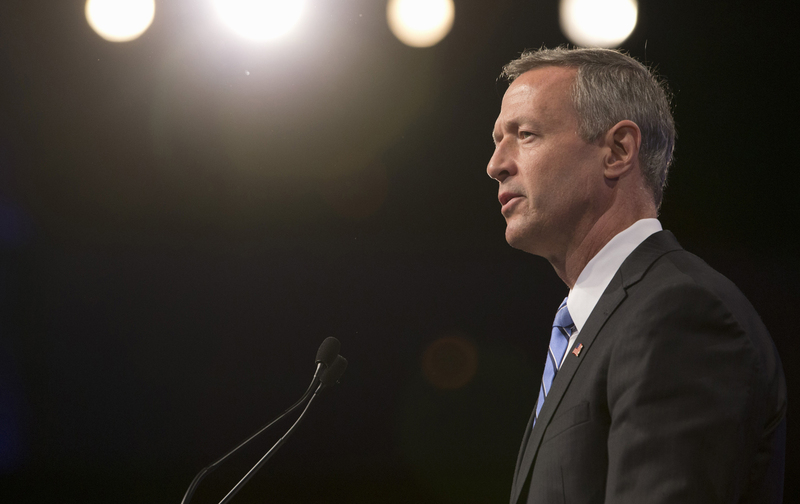 There are a couple things keeping this from being a full-blown success for O’Malley, though. First, he didn’t fair very well in the final focus group vote, tying with Clinton well behind Sanders. Now that he has a good performance and some name recognition behind him, it will be even less likely that he wins our vote, which is based on which candidate “most improved their chances”. Secondly, we can look back at the Republican debates to find a candidate who had a similar first performance, and unfortunately things did not turn out well for that candidate. Kentucky Senator Rand Paul had a similarly steady rise in the first Republican debate, which very closely mirrors O’Malley’s. 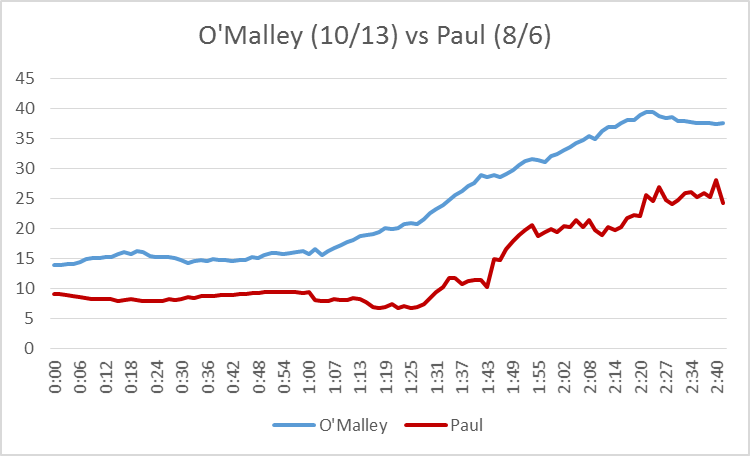 Both candidates experienced similar delays between the start of the debate and their eventual rise, both had a solid hour of moving up the ranks (Paul’s was a bit choppier because of how many other candidates were affecting his price), and both ended a close second in the market and tied for a distant second in the vote. Unfortunately, Paul’s good performance didn’t translate well to his poll numbers, nor did it lead him to repeat success in the following debate. O’Malley has less rivals to compete against for attention, but if Paul is any indicator it won’t be easy for him to carry this momentum over. See how he fares in the month between now and Des Moines, but don’t let one debate that exceeded expectations trick you into betting the farm on O’Malley.